From the 16th floor of the Toronto- Dominion Centre’s southernmost tower, Tim Hockey, president and CEO of TD Canada Trust, looks out over a changing city. There’s a black treadmill by his office window. In addition to running, the tall, fit CEO is an avid cyclist. He participates in numerous charity rides every year. 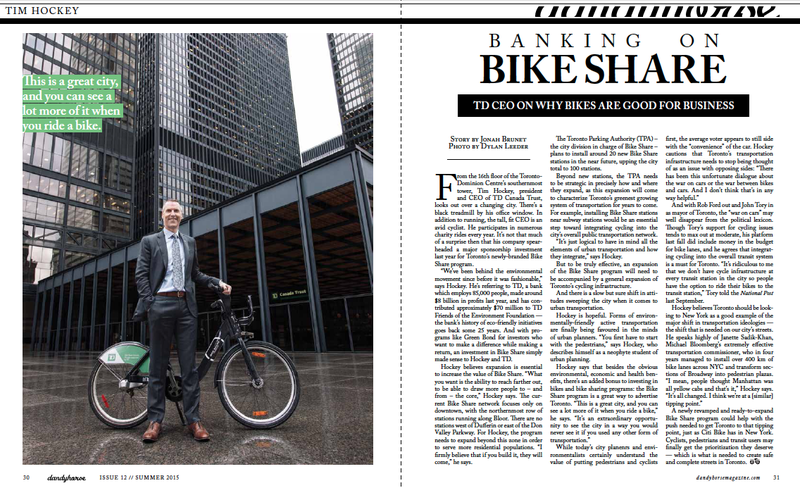 It’s not that much of a surprise then that his company spearheaded a major sponsorship investment last year for Toronto’s newly-branded Bike Share program. “We’ve been behind the environmental movement since before it was fashionable,” says Hockey. He’s referring to TD, a bank which employs 85,000 people, made around $8 billion in profits last year, and has contributed approximately $70 million to TD Friends of the Environment Foundation — the bank’s history of eco-friendly initiatives goes back some 25 years. 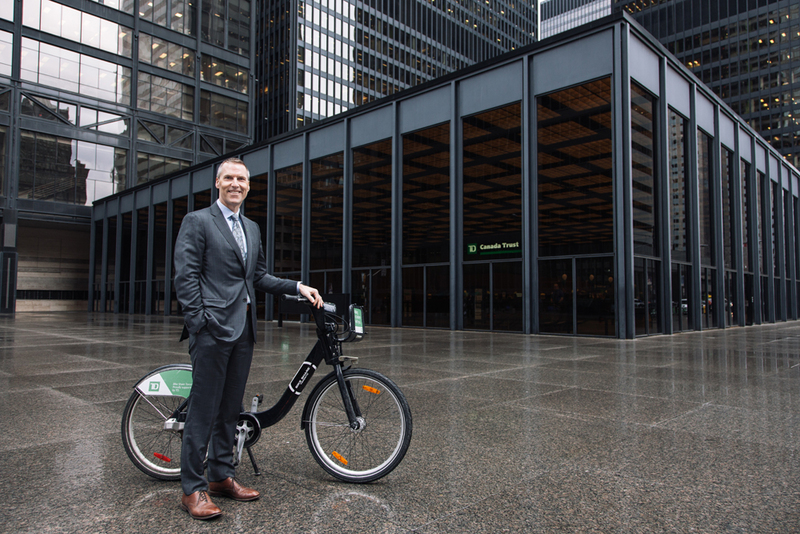 And with programs like Green Bond for investors who want to make a difference while making a return, an investment in Bike Share simply made sense to Hockey and TD. Hockey believes expansion is essential to increase the value of Bike Share. “What you want is the ability to reach farther out, to be able to draw more people to – and from – the core,” Hockey says. The current Bike Share network focuses only on downtown, with the northernmost row of stations running along Bloor. There are no stations west of Dufferin or east of the Don Valley Parkway. For Hockey, the program needs to expand beyond this zone in order to serve more residential populations. “I firmly believe that if you build it, they will come,” he says. The Toronto Parking Authority (TPA) – the city division in charge of Bike Share – plans to install around 20 new Bike Share stations in the near future, upping the city total to 100 stations. Beyond new stations, the TPA needs to be strategic in precisely how and where they expand, as this expansion will come to characterize Toronto’s greenest growing system of transportation for years to come. For example, installing Bike Share stations near subway stations would be an essential step toward integrating cycling into the city’s overall public transportation network. “It’s just logical to have in mind all the elements of urban transportation and how they integrate,” says Hockey. But to be truly effective, an expansion of the Bike Share program will need to be accompanied by a general expansion of Toronto’s cycling infrastructure. And there is a slow but sure shift in attitudes sweeping the city when it comes to urban transportation. Hockey is hopeful. Forms of environmentally- friendly active transportation are finally being favoured in the minds of urban planners. “You first have to start with the pedestrians,” says Hockey, who describes himself as a neophyte student of urban planning. And with Rob Ford out and John Tory in as mayor of Toronto, the “war on cars” may well disappear from the political lexicon. Though Tory’s support for cycling issues tends to max out at moderate, his platform last fall did include money in the budget for bike lanes, and he agrees that integrating cycling into the overall transit system is a must for Toronto. “It’s ridiculous to me that we don’t have cycle infrastructure at every transit station in the city so people have the option to ride their bikes to the transit station,” Tory told the National Post last September. A newly revamped and ready-to-expand Bike Share program could help with the push needed to get Toronto to that tipping point, just as Citi Bike has in New York. Cyclists, pedestrians and transit users may finally get the prioritization they deserve — which is what is needed to create safe and complete streets in Toronto.